SEOUL, Sept. 4 (Yonhap) — The special envoy of South Korean President Moon Jae-in to North Korea plans to discuss ways to completely denuclearize the Korean Peninsula when he visits the communist state this week, the envoy said Tuesday. “The special delegation also plans to hold discussions on ways to completely denuclearize (the peninsula) and establish lasting peace on the Korean Peninsula,” Chung Eui-yong told a press briefing, one day before he was set to embark on a one-day trip to Pyongyang. Chung, head of the presidential National Security Office, will be leading a five-member delegation to the communist state that will include National Intelligence Service Director Suh Hoon and Vice Unification Minister Chun Hae-sung. The visit is aimed at arranging a bilateral summit between Moon and North Korean leader Kim Jong-un as the countries have already agreed to hold a third Moon-Kim summit in Pyongyang this month. “First, the delegation will seek to set a specific date for the South-North summit that the countries have already agreed to hold in Pyongyang in September,” the top presidential security adviser said. “Second, it will discuss ways to develop South-North Korean relations by implementing the Panmunjom declaration,” he added, referring to the inter-Korean agreement reached by Moon and Kim at their first-ever bilateral summit in the border village of Panmunjom on April 27. The leaders of the two Koreas met again in Panmunjom on May 26. The North Korea trip by South Korean officials comes amid an impasse in denuclearization talks between the United States and North Korea, despite the historic summit between U.S. President Donald Trump and the North Korean leader. In the first-ever U.S.-North Korea summit, held in Singapore on June 12, North Korean leader Kim agreed to completely denuclearize his country in exchange for security guarantees from the U.S.
Trump, however, recently called off a scheduled trip to Pyongyang by U.S. Secretary of State Mike Pompeo that was aimed at discussing ways to move forward the North’s denuclearization efforts, citing a lack of progress in the denuclearization process. Officials from Seoul’s presidential office Cheong Wa Dae have repeatedly expressed hope that the visit by the South Korean team will help lead to the resumption of denuclearization talks between the U.S. and North Korea. “I wish that (the envoy) will also fulfill his role as priming water to enable a North Korea visit by U.S. Secretary of State Mike Pompeo and progress in the denuclearization talks between the North and the U.S.,” Moon’s chief of staff Im Jong-seok said earlier. Chung, too, stressed the need to resume the U.S.-North Korea dialogue, saying his mission includes efforts to move forward the denuclearization process. He also said he will be carrying a personal letter from Moon to the North Korean leader. Still, the special envoy of the South Korean president highlighted the importance of improving inter-Korean relations as well. 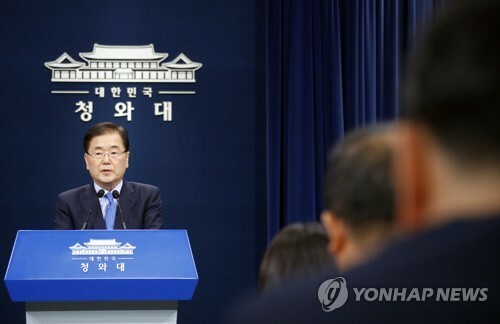 “We believe development in South-North Korean relations may be a force driving the denuclearization of the Korean Peninsula and that we may tow negotiations on the denuclearization of the Korean Peninsula through development in the South-North relationship if necessary,” he told the press briefing. Chung’s delegation is set to return home later Wednesday using a direct flight across the inter-Korean border. Chung expressed his hope to meet the North Korean leader during his upcoming North Korea trip but said no such meeting has been arranged yet.